Time flies. And then there are days that seem jet propelled. And in months that I haven’t written I’ve: visited ten independent New York City schools, attended 30 related events‑open houses, parent interviews, child interviews…opps I mean play dates, diversity nights, curriculum nights—mixed in with Christmas shopping, then the holidays with friends and family, and fought to assembled a two thousand piece, three-foot-tall My Pretty Pony Castle that Santa brought, and won. Cooking Christmas dinner for my family, hosting the Holmes Family Annual Jenga Tournament on New Years Eve, MLK Day, Presidents’ Day, and tax filing. So the time and attention that frequent went to my blog, went to, say, my life. Then came 100 day at Julia’s school. A day I’ll never forget. Not because I’m a closet arithmomaniac, but for the creation Julia and I made for the event. “Remember Mommy we have to make our 100 project,” Julia reminded me at breakfast, in celebration of 100 days of school. “I do. I’ll have Natasha pick up the materials to make our project.” Then I grabbed my purse, plucked out my wallet and pealed out twenty bucks then slid the bill on to the dinning room table‑‑for the purchase of a Mylar balloon and a bag of 100 count cotton balls. We would make the sky. The only hard part of the day I anticipated was ditching my annual co-op board meeting so I’d have the mental bandwidth to work with Julia. The meeting is held in the building’s lobby. And there’s one way into the building, through said lobby. So one has to do the walk of shame past the board members and the other owners, just to get home, to your child, to your second job. The hardest part of being a single parent is my inability to divide myself. And while I wanted to attend the annual meeting which covers a deep dive into the building’s finances: how many gallons of heating oil the boiler burned this winter, healthcare costs of the doormen, future projects and more all that data would have to wait for me to receive the published report. I had a date with my daughter. I came in the house ready to dive in. As Natasha gathered her coat and purse, she said, “I purchased quick dry glue to make it easier,” then she headed to the front door. I couldn’t image why she’d bought glue since we had glue in the house. About twenty cotton balls in, I understood. Cotton is surprisingly unwieldy. After an hour of teamwork, and the support of a glass of Cabernet for mommy, the blue sky with clouds was really taking shape. Another half an hour, Team Holmes had completed the job. By then Julia’s bedtime had arrived. Pajamas on, teeth brushed, when I went to tuck her in, I found her room empty. “Where are you?” I called out. We had breakfast and dressed, then I searched for a large enough plastic bag to transport our work of art to school. “No! I want to carry it,” Julia said, hugging the cloud to her tiny chest. Minutes later Julia was clutching the balloon like a baby seal walking out of the elevator into the lobby. “Oooohhh, I like your balloon,” Carlos the doorman crooned. “Mommy and me made the sky!” Julia announced. Then we walked out of the building and into the bitter cold March morning. Our twelve minute walk to the subway station on Broadway wasn’t looking so fun. “Let’s take a cab,” I said. Seven minutes later we prepared to exit the cab in front of the school. The building is very close to the Hudson River so it’s always quite windy, even on mild days, a fact that I forgot although the taxi was being pushed and shoved by an invisible gale. I passed the driver a twenty then instructed Julia to “get out and go to the curb,” while I waited for my change. And few seconds later I heard the sound of screams blasting against the taxi’s windows. Julia. I leapt from the cab and found her hopping up and down on the cement in a frenzy. No blood in sight. But silvery tears streaked her brown face, as she pointed down the block, at the sight, the Sky Balloon, tumbling and falling down west 120th street in the gale. I’ve seen some shocking things of late: The rise of Donald Trump in his own global reality TV show, Pluto’s demotions from a planet into a plutoid, and Bruce transforming into Caitlyn the Vanity Fair Magazine pin-up girl, but seeing my child’s 100 day project manhandled by the wind, hemorrhaging cotton balls across the sidewalk, my daughter sobbing, crushed me beyond belief. Julia and I took off after the blue balloon tumbling across the grey cement. For a good fifteen feet I scrambled to collect the white wounds as the battering winds shoved The Sky towards Claremont Avenue, towards the destruction that passing car tires would levy. Fear clutched my throat. I quickened my pace. Julia would not recover from seeing the death of her Sky. I had to stop it. I sprinted harder. But The Sky was too fast for me. The man snagged the sky like a soccer ball, scooping it into his arms. I ran up to him and had to fight the urge to thrown my arms about him. The man nodded, smiled then moved away. I sensed he was a parent, he knew the baby bomb was about to go off. “But it won’t be 100 cotton balls,” she sobbed. I reached into the pocket of my jacket, and pulled out a wad of white. “No, I got them all,” I lied, eyeing a few victims trapped in the near by storm drain. Ten minutes later, after I dried Julia’s face and dropped her at the gym with her class, I was hard at work reapplying lost bits of cloud, using the top of her clubby as a work station. Passing parents eyed me curiously. I hardly noticed, my mind focused on the thoughts running like bulls through my mind. One in particular stood out, the most important balloon lesson of all: There will always be something, a lost balloon, a lost job, seemingly lost chances. There will always be something that threatens to upset the day, the child, the mom. Such is the life of a parent, especially a single parent. All I can do is make sure I have glue, and good prayers. The Sky Balloon finally at rest. Twenty minutes later, I slid into The Big Sing, a monthly event the school holds, just in time to applaud the last two songs the children sang with my sticky, shiny, gluey hands. When the Head of School announced it was time for the grown ups to leave, and the children started singing and the “Goodbye Grown-Ups!” song, I made my way through the throng of people over to where Julia’s class sat. “Why I didn’t see you here before?” Julia asked. She thought about it for a moment. I wanted to tell her that she would use that observation to put many things back together during her life, that she would use her spiritual glue to repair broken dreams and smashed goals. That she would one day again watch another beloved tumble way from her, trampling heart, and would have to decide whether to chase it down. Or let set it free. That wild winds would blow her good away, along with her faith in right and proper outcomes. And that she would have to make a choice every single time. Let it go. Or get out her bottle of glue and remake the sky. In the rush and fury to get Julia to school on Friday after she fell to the lure of a large, brown, cardboard box and clear popcorn packing sheets from a delivery, the kind of magic no kid can fight, as we rushed and ran to the elevator and out the door so she could ring the bell and announce, “Time for Morning Meeting!” Julia’s class job for this week, I grabbed a colorful scarf from my closet to guard against the late October chill. “I like the scarf,” my super said, as George greeted us outside our building, “you look nice, ready for Halloween.” I glanced down and saw the orange tails of fabric set against my black coat. Only then did I realize the day. For many years, October 31st marked a solemn time, a new trail of tears to join a long, curved, bumpy road. This was day, two decades ago, I learned that the man I’d planned to marry had, after complications from pneumonia, died. I MOVE FORWARD INTO GREATER GOOD. When we stand at the end of one life experience—the conclusion of a job or relationship, moving away from home, graduating from school, or retiring from a career—we remember that every ending is also a beginning. Saying goodbye to what has been, we welcome what will be. We may be tempted to keep looking back, but once we turn our eyes to the path ahead, we find new opportunities awaiting us. We are beginning a new phase of life, a new way of fulfilling our purpose, a new way of serving God and the world. In truth, we don’t leave anything behind; we carry it with us. As we bless our past, we build on all we have learned and continue on our life’s unfolding journey. 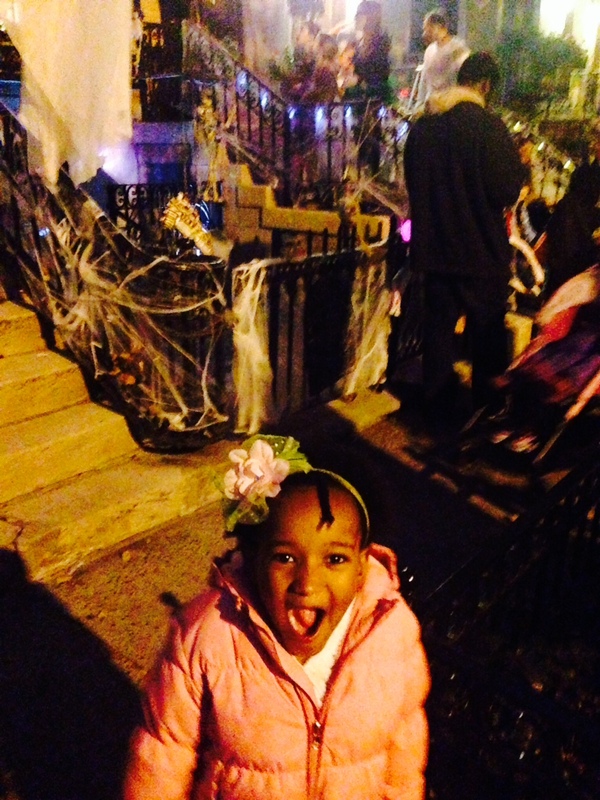 Halloween 2014 served as the launch of Julia’s costume; her candy procurement route; and my plan to stash the loot in our apartment before my kid hits the crack-sugar-zone. Mourning did even make the list. “Time heals all wounds,” I’d heard from family and friends. But Art’s death left a crater-sized wound. “You can have what you want in life, just not in the order society tells you,” my then shrink told me over and over again. I’m so grateful that I believed her. On the way home Friday after work to pick up Julia and take her Treat or Treating, a baritone voice started up in the subway crooning,“A Change is Gonna Come.” The A, C and E trains seemed to still in relevance. The crowd stopped its shuffling for position on the platform. The chords echoed through the subterranean tunnels creating a chapel like atmosphere. This tune sung by Otis Redding or Curtis Mayfield, given the odd mood, can shape a walnut size lump in my throat and wetness my eyes I cannot blink back. On Halloween 2014, I settled into the song, into understanding that change does come, and some times it even brings along a measure of peace. After twenty plus years of living in New York City, I would like to believe I don’t shock easily. I have kept a game face when the guy with the beat up saxophone comes into the subway train I’m riding in and proceeds to press all the keys with no rhythm, rhyme or reason, producing offensive honks and hoots to exort money…ah, I mean to elisit donations from passengers. I have managed to keep my head buried and focused behind a book when gymnastic, break dancers work their moves between subway stops, and passengers, landing inches from my feet. And in some cases, my lap. However, a recent photo sent by my nanny of Julia broke my streak. The short of the long is, at the age of forty, I began studying the cello. I love its rich, lush sound—a tone my teacher once described as the closest in tonal quality to the human voice than any other instrument. While the act of playing gives me great satisfaction, I’m no Yo-Yo Ma. I just go at it in my living room, sans audience. And unless you’re hot-guy-single-guy, don’t even ask to listen in. In fact my daughter hasn’t seen or heard me play, for anther reason than shyness. Since Julia came into my life, my extra hours go to writing, not, at the moment, playing Bach. So, a few Tuesdays ago, music class day on the Upper West Side, when a fresh new image landed on my iPhone, I didn’t even check it right away. ( I was in a meeting.) My phone always pings around 11:30, with an image sent from the nanny. But this shot made me gasp. Look at that bow hand! I’d always had a little fanasty that one day, I’d play my full size cello, and my kid, a quarter-size model, that we’d create music together…seems like that vision is catching up to me. 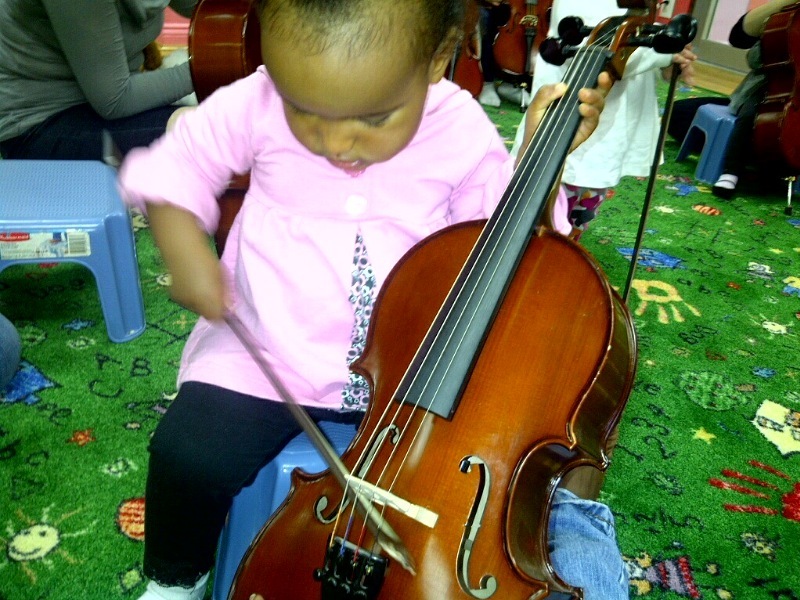 Sure, Julia might be sawing on might a violin, and not a mini cello. Maybe. But either way it leads me to wonder what other tricks does Miss Julia have up her onesie. Enter your email address to subscribe to the single baby mama blog and receive notifications of new posts by email.